I've been busy making 3/4" pentagon flowers and have written a new pattern. I have mostly used the new fabric line by Edyta Sitar called Little Sweetheart. 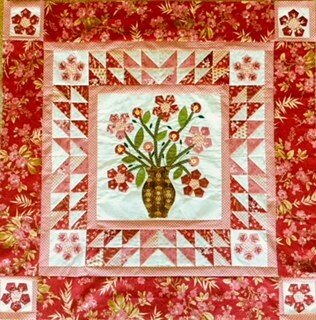 The vase and stems on the center block are Kim Diehl fabrics, and the leaves are from scraps. I've done the applique' by hand, but you could certainly applique' this quilt center by machine. 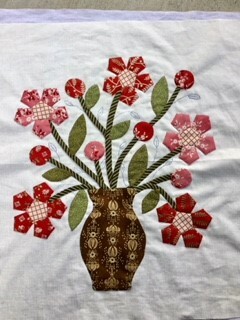 I've added some small embroidery stems and leaves and embroidered the flower centers, but you can leave those out if you don't like to embroider. This is what the center looks like before the embroidery has been added. 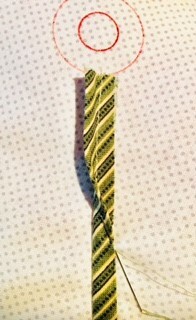 I also show you a trick that I use to applique' stems. Whether you are doing the applique' by hand or by machine, this trick will cut your stitching time in half. I always wonder how people name their patterns or their quilts. Sometimes I try to look for some deep, hidden meaning in the names. In case you are wondering how I came by the name Four O'Clock Fancy......I just mailed a birthday card to a friend from back in grade school days. She and I used to play outside a lot and would watch the Four O'Clocks bloom every afternoon, and we would gather the seeds. That's where the Four O'Clock came from, but it took awhile to find something that would go along with it. The Fancy came when I opened up our Tiki's cat food......Fancy Feast. Pattern is available on Craftsy here or in my Etsy shop here or at Back Door Quilts here. I'm linking up with my friend Judy at Small Quilts and Doll Quilts for Design Wall Monday. Very pretty quilt. I really like the center medallion with the unique pentagon flowers. I've never seen a flower like that. The whole thing is adorable! I love this. Went straight to your ETSY page and purchased this pattern as well as the Sunburst Dresten Table Topper. The pentagon shapes make pretty flowers. I didn't realize that you had an Etsy shop. I just paid a visit to it. 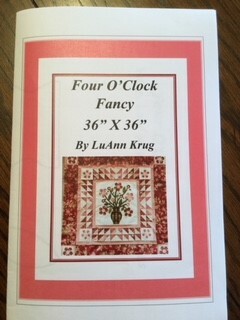 That's a very sweet quilt LuAnn, I have made stems using that method which I learnt from Di Ford. Love your pentagon flowers! Your new pattern is a perfect size too.